Sunanda Sahay practices Madhubani painting, a folk and tribal art from the region in which she grew up. This traditional art has survived through centuries by becoming an integral part of the local rituals and storytelling. Traditionally, women painted their mud walls to celebrate every festival, wedding and childbirth, and to ward off evil. But this style of painting has been dying a slow death because it was not financially sustainable, and was barely known outside of the rural district of Madhubani. Sahay grew up seeing village women painting this art to supplement meager family income and pass on their skills to their daughters. They painted the mud walls of their home and temples, but later started to transfer the art form to paper and garments for commercial purposes. They also adopted modern paints, abandoning nature-derived paints, which were once closely guarded secrets among families. 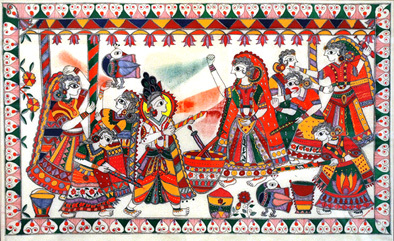 Though the materials changed, the form, content, and techniques of Madhubani painting remain the same and continue to depict widely assimilated stories from mythologies, rites, and rituals of daily life. Although this form of painting is a proud legacy for millions of people living in the Madhubani region, it is not widely practiced by artists. Villagers decorate their homes but people find it hard to make money by selling paintings because of its rigorous and time summing style, and a general lack of art patrons and art dealers in this impoverished region. Apprentice Sanjana Krishna is being raised in a home steeped in the artistic traditions of India. She sought out Sunanda Sahay, having known about her work for several years. She enjoys not only learning to draw and color in the Madhubani form, but also learning about the symbolism behind the paintings and the evolution of the style as it has been practiced in India. Their apprenticeship will focus on creating Madhubani's stylized forms, including the figures, borders, and motifs. They will listen to and discuss the stories, history, and symbolism behind the art. Sahay will also teach Krishna to work with the natural colors extracted from mineral and plant juices that native painters once used.